It’s too late for the sweets and decorations, but maybe we can stop the music? AS WE’VE DOCUMENTED, Christmas seems to be starting earlier and earlier for shops every year. The selection boxes have been in the shops since the start of September, Dublin Airport’s shopping area has had a fully decorated tree up for weeks, and the Penneys windows are a veritable Christmas grotto at this point. However, one campaign is working to prevent one aspect of Christmas shopping from starting too soon – the music. 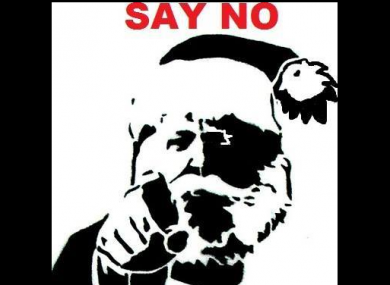 … stop stores cynically playing Christmas music too early in a bid to get us spending! The campaign is contacting individual businesses and asking them to make a commitment to delay playing Christmas songs until December 1. So far a number of businesses have done so, including coffee chain Costa Coffee. Email “Campaign aims to stop Irish shops from playing Christmas music too early”. Feedback on “Campaign aims to stop Irish shops from playing Christmas music too early”.